Infrared technology on grills has become a big feature in recent years. Infrared technology on grills has become a big feature in recent years. In the standalone grill market, we have manufacturers like Napoleon who use infrared technology as a key selling point. Infrared can provide quick and efficient heating that penetrates into large cuts of meat. Your food is cooked faster, more thoroughly, and it can be argued that there is less moisture lost in the process. 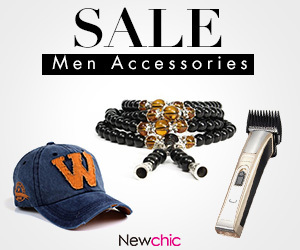 Of course, most of the best infrared grills on the market are large and expensive. 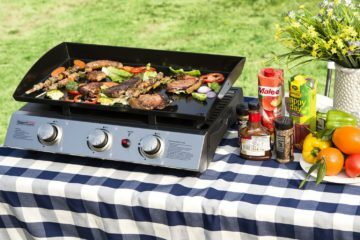 What if you want a compact grill that can be used as a tabletop grill for home use, camping, tailgating, or even fishing? The Char-Broil Grill2Go X200 Portable TRU-Infrared Liquid Propane Gas Grill aims to address the unique scenarios when you want a small gas grill that includes infrared technology. Is this a gimmick design, or is it actually something usable in a small package? It’s time to take a look at the full review and find out. Although a small and portable grill, the X200 actually provides a decently sized grilling surface. These are the most important features of this best infrared grill. Strong construction designed for the road. Cast aluminum construction. Latching cover and carry handles. Cooking system reduces flare up. 200 square inches total cooking surface. Who Has This Grill Been Designed For? 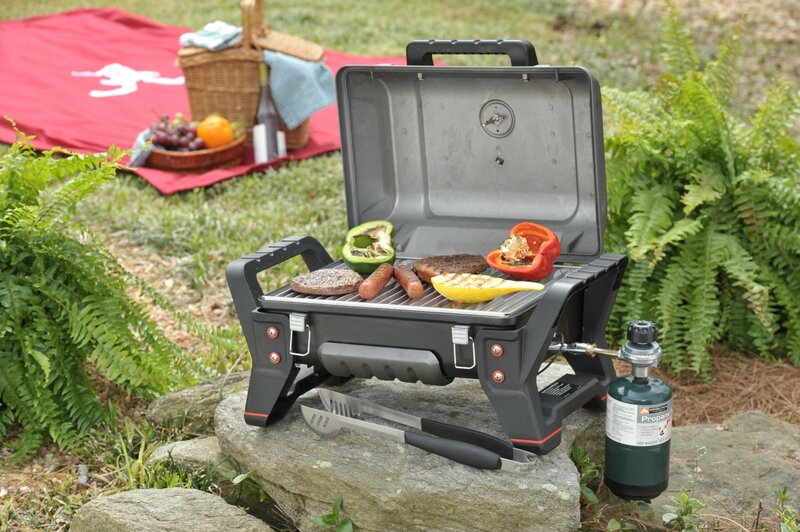 This is also the perfect grill for picnicking, because it can be taken almost anywhere with ease. It would be a bold claim to call any model the best infrared portable grill, however, even on first glance it is apparent that this grill would have a good shot at the title. If talking about portable grills, then there are only a few alternatives on the market. If you need a grill that is relatively small and lightweight (this weighs in at 20 pounds), then this is definitely one that you’ll want to take a look at. There are lighter grills available, but they don’t feature the same infrared system, and almost none of them have the same heavy duty design that the Grill2Go features. You’ll want this grill if you regularly cook while tailgating, if you camp often, if you’re a hunter, or even if you regularly go fishing. 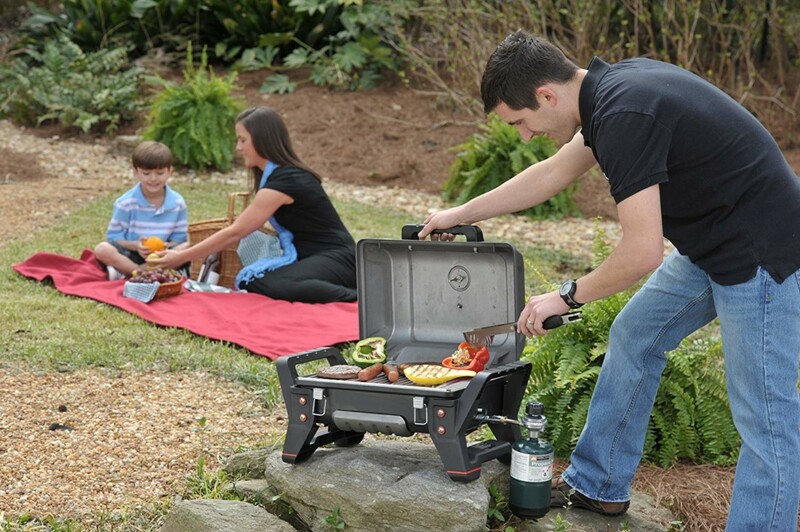 This is also the perfect grill for picnicking, because it can be taken almost anywhere with ease. You won’t need a large propane tank, and can instead run this from small 20 pound disposable tanks. Looks play an important part when selecting a large outdoor grill, but they’re not quite as important when you are looking for something smaller. Even so, this is easily one of the best infrared grills in terms of looks, at least when we are considering portable models. It has a unique rugged design that clearly indicates it’s made for the outdoors. You won’t feel like this is a dainty piece of cooking equipment. Instead, it feels like a real piece of hardware, and that helps to inspire confidence in its longevity. All in all, you’ll be buying a heavy duty portable grill that still has a decent enough surface size for family cooking. It’s obvious that this grill isn’t designed to be a primary centerpiece of an outdoor dining area, but it can sure outperform some other small grills that are on the market. Testing it Where It Matters – How Does It Perform When Cooking? The reality is that it is bigger than it looks, and 200 square inches shouldn’t be quickly dismissed. No matter how good a grill looks, how much it costs, or how good the features are, nothing else would matter if the cooking performance wasn’t up to par. With the Grill2Go, Char Broil has done a great job, designing an excellent cooking surface that can easily be used for a number of different foods. The first thing to consider is the size. When shopping online you might get the impression that this grill is overly small and only capable of cooking the smallest meals. The reality is that it is bigger than it looks, and 200 square inches shouldn’t be quickly dismissed. Consider that a large home grill sometimes has only 700 square inches of cooking space, and that means that this portable model is almost one third the size. You can easily cook meals for two to four people, and you can cook for more people depending on the ingredients. 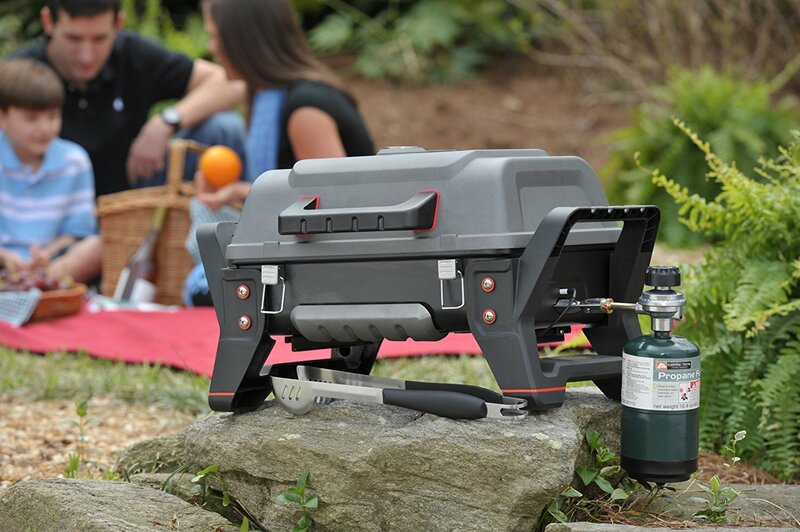 Even if you have to grill for a little longer, this compact unit will still get the job done. Think about the different types of food that you would be cooking when tailgating, camping, or even fishing. Most of the time you will be sticking to the classics, such as skewered meat and vegetables, steak cuts, burgers, or maybe boneless or smaller cuts of bone-in chicken. For all of this, you’ll have more than enough space. Cooking sausages and hot dogs is easy, and you’ll be able to get 10 – 20 on the grill, depending on the style and size of the sausages. There’s even a hood on this grill, and although it’s not what you might be used to with a full sized grill, it still allows for some decent closed top cooking if you want to slightly roast some of your food. The closed hood is great for cooking fish, burgers, or even for heating bread or mini pizzas. Despite its size, the grill is much more versatile than it looks, and this helps to make it one of the best infrared grills on the market today. With all this in mind, it’s still important to understand that there are clear limitations to the grill. Larger cuts of chicken or even roast cuts of beef and pork would be difficult to cook on such a small grill, so that’s something that you need to keep in mind. Be realistic with what you expect from a small grill and you’ll find that the Char Broil Grill2Go doesn’t disappoint. In fact, in many ways it will actually surprise you, because it does go beyond what most would expect from a grill of this size. To use the old cliché; looks can be deceiving. The size of this grill is not a negative. In fact, it’s the perfect compromise for something that provides plenty of surface area, while still being portable and relatively lightweight. Infrared Cooking – Does It Help? We’ve checked out the cooking experience with this grill and have been thoroughly impressed. It reaches high temperatures, can cook thoroughly, and it even has a temperature gauge built into the hood. The big question, is whether the infrared system is simply a gimmick, or does it actually make a difference? There are a number of inherent benefits to infrared cooking technology. One of the most important is that infrared can reduce gas usage by providing supplementary heat. In a portable grill, this is quite important, because your gas supply will be limited. Infrared heat sources can also produce high searing temperatures to cook the exterior of food much faster. That heat also radiates to the inside of food, and in some cases the cooking times can be reduced by up to 4x. This will vary depending on the food your cooking, and it’s recommended you use a meat thermometer as you get used to this grill and adjust to the cooking times. Although it’s a small grill, we can say that the infrared technology does make a difference. Much like you would experience with a larger grill, the infrared on this system can reduce the cooking time and allow for a better sear. It also works to spread heat evenly across the surface. This makes cooking steaks and other large flat cuts of meat easy. It’s also great for burgers in this respect. If you’ve used low quality portable grills, then you will know how frustrating it can be to work around the cool and hot spots on the grilling surface. This is the best infrared grill for portable users because there is no cool spot. Uniform temperature across the surface makes a huge difference to how you cook and enjoy the grill. It uses aluminum for the construction, but the firebox is made from a solid cast. At this point you already know that the grill has a rugged and portable design, but is it backed up by good construction quality. The answer is yes. It’s hard not to get excited about this grill, simply because it’s far and above what is typical in the portable grill market. It uses aluminum for the construction, but the firebox is made from a solid cast. This isn’t flimsy aluminum like you would find on a low quality product. Aluminum of this type offers good strength but it doesn’t add unnecessary weight, which is important for a portable grill. There are few moving parts on the grill so there’s nothing to break, and the design is impact resistant. There are side carrying handles to move the grill around a surface, as well as a large single carry handle for packing it up and loading it into your car, boat, or camper. There’s nothing to complain about with the construction quality, and it’s actually one of the most well-made portable grills that we’ve reviewed. As far as ruggedness goes, you won’t find many other models that can compare. 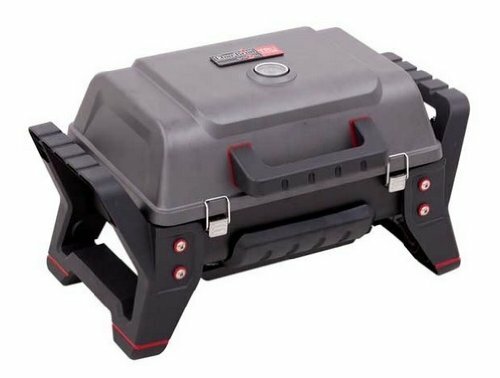 If you think your portable grill will have a hard life with regular use, then this is the model that you should be considering. At this point of the review, you will have realized that there is very little to complain about with this grill. Many of the pros are inherent to the design and basic features. Lightweight but with solid construction that will last many outings and grilling seasons. Decent surface area for cooking. The infrared technology actually works, increasing temperature and reducing grilling time. Made from solid metal with a solid impact resistant stand. Excellent grill surface design which stops food falling through. Useful for any outdoor cooking scenario. 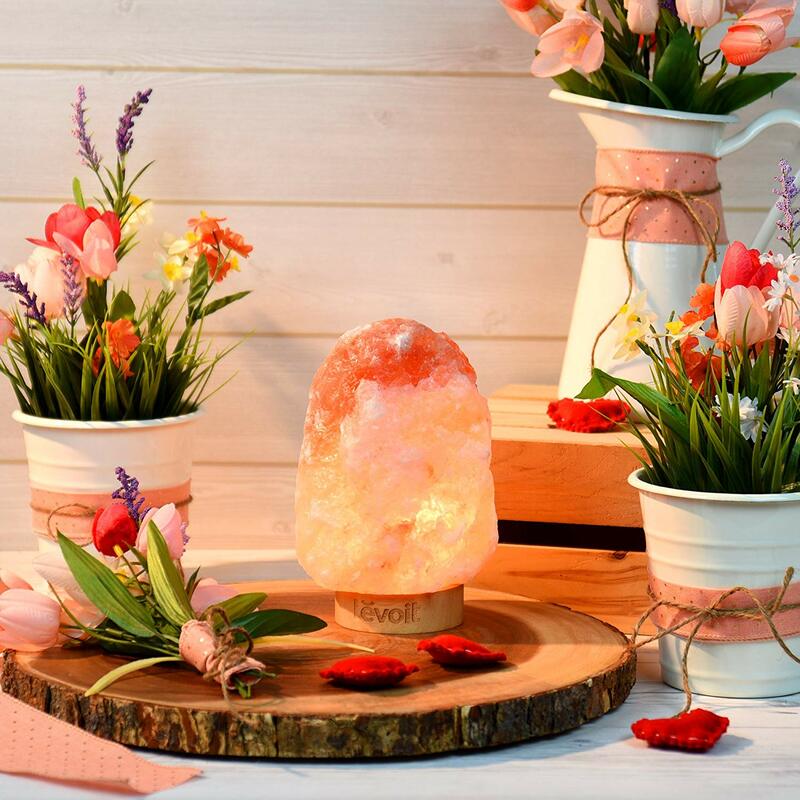 Are There Any Negatives to This Product? As one of the best infrared grills on the market, there are really no inherent downsides to purchasing this grill. It performs as advertised, surpasses expectations, and has great construction quality and an excellent rugged design. The only real downside to this grill, and one that is inherent to all small grills, is its size. 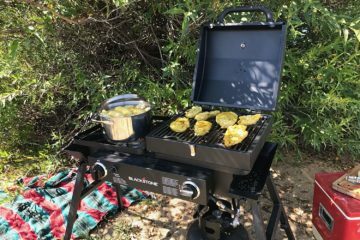 Yes, it is larger than it looks and is perfect for cooking for a small family, but there are limitations if you are cooking for a larger group of people while camping, picnicking, or even grilling at home. There’s really no way around this when you are dealing with a grill of this size, so it should not be held against the product itself.The simple fact is that if you want something larger then you will sacrifice convenience and portability. Owner reviews are a great way to determine whether a grill is right for you. With the X200, it is very reassuring to find more than 700 online reviews that average up to a score of 4 out of 5 Stars. Owners love the portability, the construction quality, and the high temperatures that the grill can reach. Many of the reviews express surprise in the capabilities of the infrared system, which actually does reduce fuel usage and cooking times. Owners also like the design, noting that it is perfect for demanding outdoor environments. Is this the best infrared grill for portable use? If you’ve been following up to this point, then you will already know that the answer is a resounding yes. 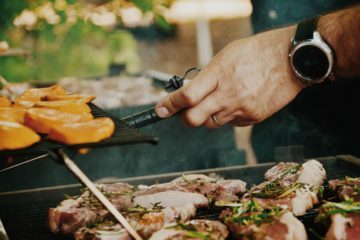 Although more expensive than some competing grills, it still sits within an affordable price range, and the ruggedness and cooking technology help to justify the price. It’s capable when cooking all of the classic BBQ foods, and it would be a great road companion for active families or even for solo cooking. If you need a portable grill and want something that is innovative and highly capable, then this is one of the best options currently on the market.